"Always drawn back to simplicity," reads a recent post on the Upton Instagram page. The museum-quality prints you'll find in the feed are just that — a nod to simplicity. Think: Of-the-moment colors, plus bold black-and-white, in simple forms. These are It prints for a certain brand of lifestyle stores — Lake, in Los Angeles, EA/ST Co. in Austin, Texas, Slate on Martha's Vineyard, where they typically feature curated collections of earthy textiles and handmade ceramics. 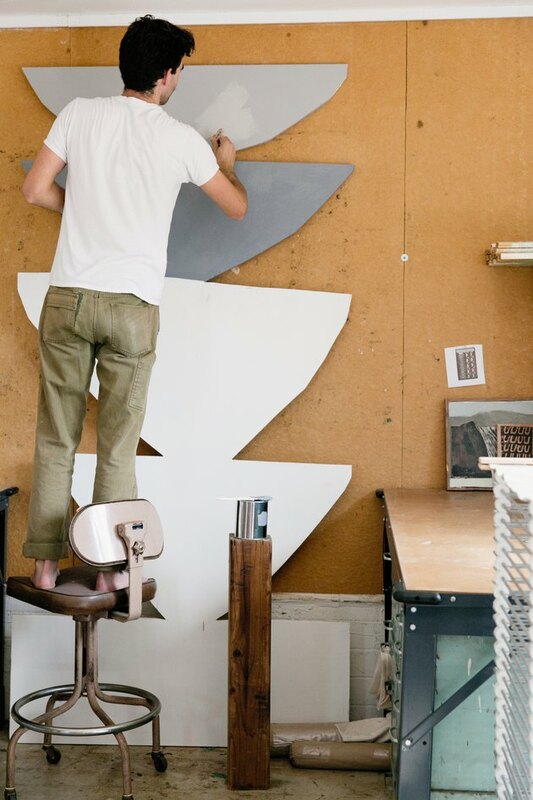 Each print is the work of Michael Upton, an artist and designer who lives with his wife Mariel Upton, a writer, and their two-month-old son Eames, in the Avocado Heights neighborhood of Vista, California — an hour north of Upton's hometown of San Diego. 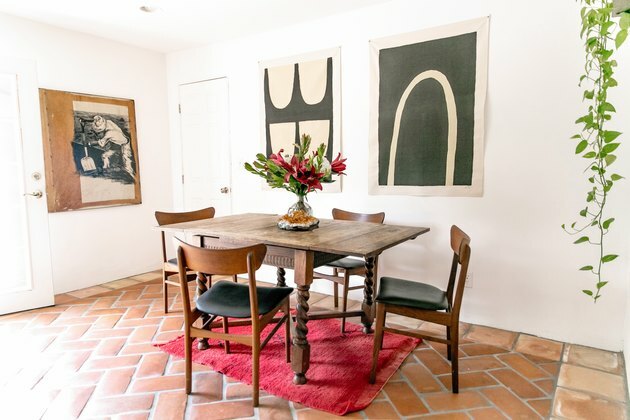 Like Michael's artwork, the Uptons' home — a petite three-bedroom, two-bath 1940s California bungalow — is a study in simplicity and understatement. A changing array of Upton's prints adorn the walls throughout. 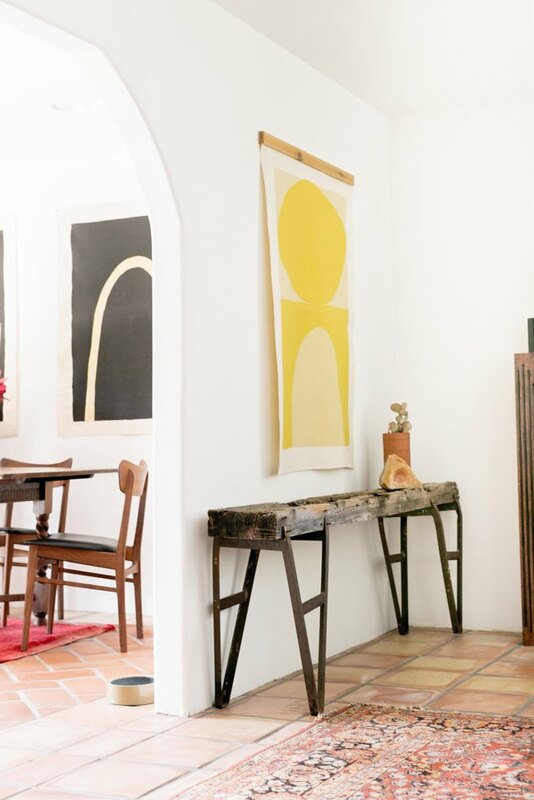 Gallery-white walls highlight the Southern California sun. Warm wood. Saltillo tiles. 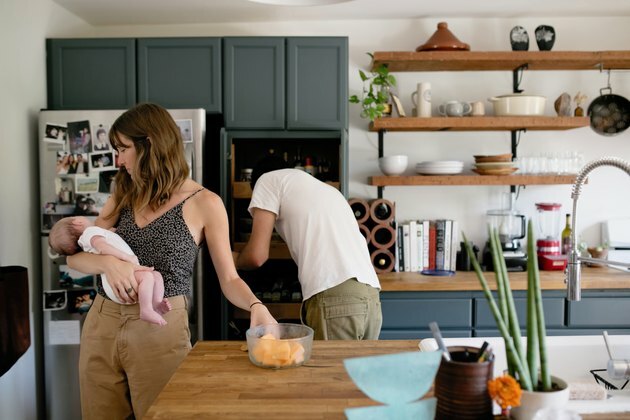 The mix of vintage and modern decor has a sense of being there, pitch perfect, right from the start — which means the considerable work the Uptons put into the home comes off as effortless. Mariel's first thought upon seeing the property, which they bought in 2012, was, "Why so yellow?" The house, down to the kitchen cabinets, had been painted butter yellow, save for one room that was bright turquoise. But the Uptons were drawn to the property, and saw the promise underneath an unfortunate 1980s remodel. 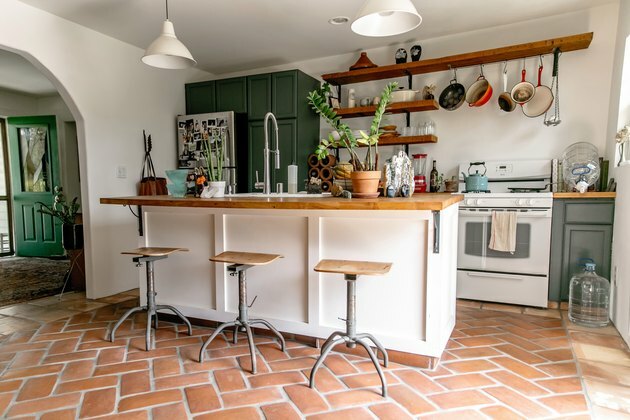 With the help of Michael's father, a contractor, the couple retextured the walls, swapped out the plastic, fake wood flooring, added butcher block and replaced dated shrubs and roses with cacti and succulents. "We basically took the house back to its original character from the '40s," says Mariel. 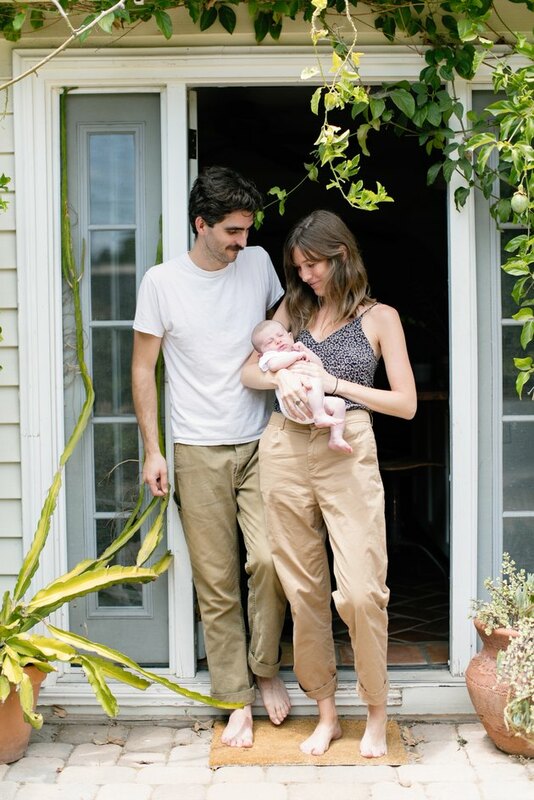 The transformation continues — most recently, with the addition of their son, Eames. "It's been six years and we are still going," says Mariel. "Not sure if it will ever stop." Michael's prints hang throughout the home — including this black and white pair in the dining room. The vintage table is special to him. "It was in my family home growing up and it's where I would spend my time drawing as a kid," says Michael. "It still has paint stains and scratches from then. I love that our son will also learn to draw on that table." 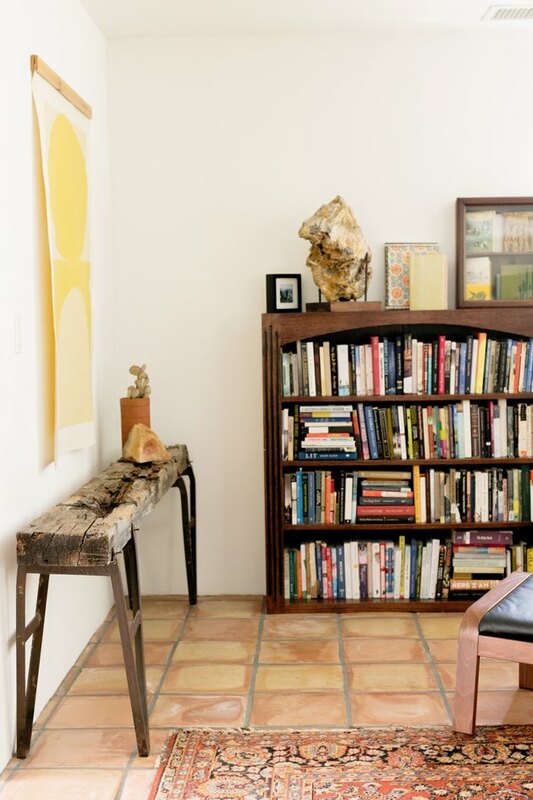 A yellow print is adjacent to the bookcase Michael built for Mariel the first year they were dating. "It holds all of my most cherished books," she says — including handmade travel diaries that Mariel put together from trips to Morocco, Portugal, Oaxaca, Croatia, and beyond. "It's filled to the brim and I'm still waiting for him to build me another. " "We both love to cook so we spend a lot of time in the kitchen," says Michael. "Some of our favorite memories are making elaborate meals together in that kitchen. The day Mariel went into labor with our son we made four loaves of sourdough from scratch." 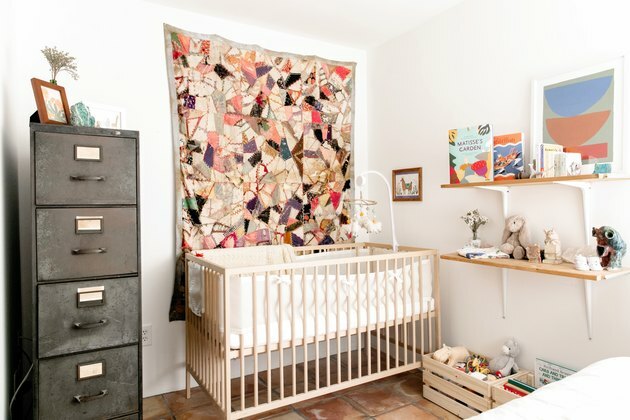 Even the nursery has a subtle, collected feel to it. "Our home decor has been picked up one piece at a time over the years, mostly from swap meets," says Mariel. 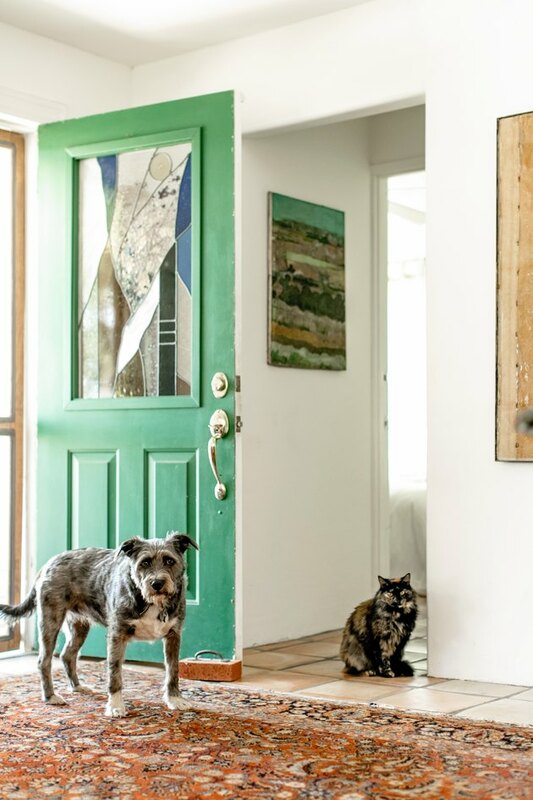 The Uptons share their home with their dog, Sadie, and two cats, Penny and Waffles. 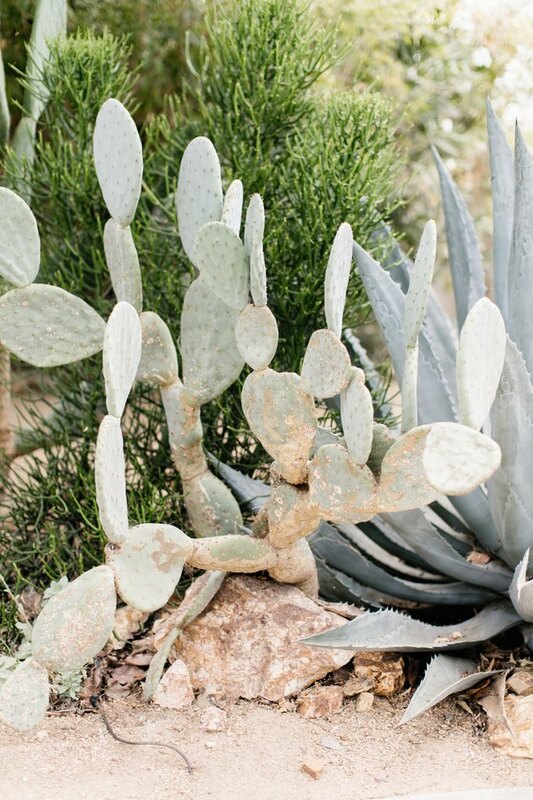 Outside, dated landscaping gave way to climate-appropriate succulents and cacti. 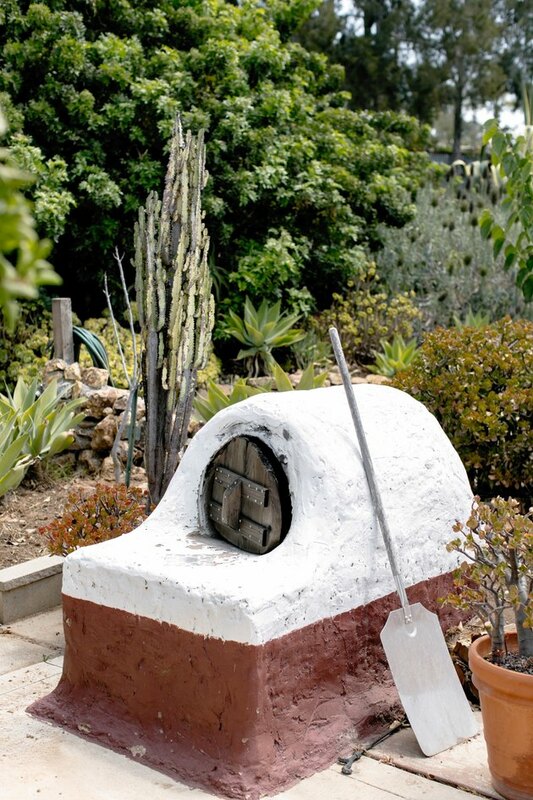 The Uptons built their own pizza oven. They also constructed a simple outdoor shower in the ample backyard space. 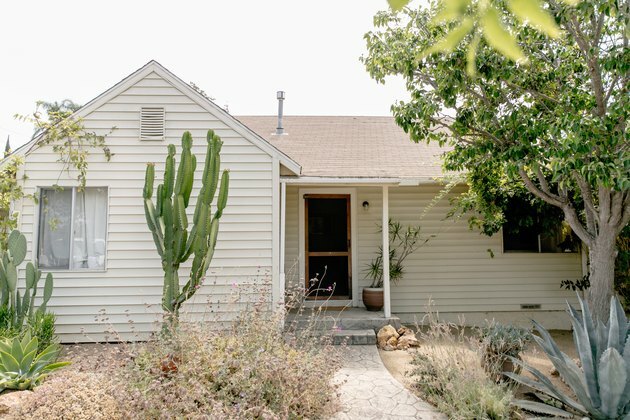 "We loved the neighborhood because it felt a little more rural while still only being 10 miles to the beach and 45 miles to the city of San Diego," says Mariel. 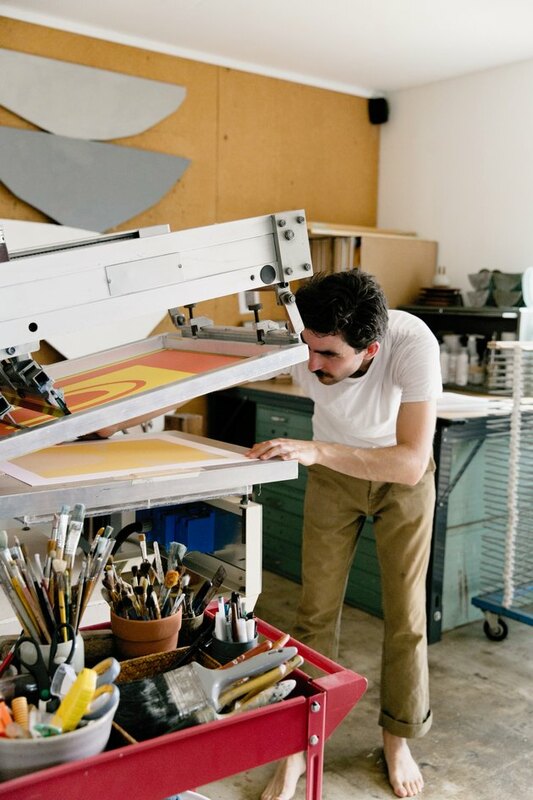 Michael, at work on a new print, in his home studio. Each piece is made by hand using museum quality materials and methods, either in Michael's home studio or by craftsmen around the world.